The Illustrated London News, 1942. The Minister who hustles. William Maxwell Aitken, traversed the worlds of politics on both sides of the ocean. Effortlessly he mixed and mingled in politics, finance, newspapers, revolutionising them without so much as a backward glance. In 1910, Aitken, with his family, moved from his native Canada to London, where he had an unswerving belief in the British Empire and he set about becoming a major and influential part of his new home. One of his many influential contacts was Andrew Bonar Law, the leader of the Conservative Party. As pointed out in David George Boyce’s biography of Aitken, “The two men got on well, despite their very different individual temperaments, both had Scots-Canadian connections, both were sons of the manse, both were businessmen”. He propelled himself into Parliament, as well as acquiring the majority shareholding in the Daily Express and the Evening Standard. He became known as a fearless political fixer, and he was one of only three men to serve in cabinet in both wars. August 1914, at the outbreak of the First World War, Aitken became honorary Lieutenant-Colonel and was appointed to help the Canadian Overseas Expeditionary Force. He was instrumental in creating the Canadian War Records Office in London, and arranged for stories about Canadian forces appearing in newspapers. In January 1916, Aitken published the first volume of “Canada in Flanders”. During World War I the new Prime Minister of England, David Lloyd George granted him peerage as Lord Beaverbrook in 1917. There are two points-of-view on how he acquired the name “Beaverbrook”. The New Brunswick view is that he had fond memories of his days in Newcastle and remembers fishing at a place called “Beaver”. The U.K. version is that he pointed to the map of New Brunswick and stuck his finger on a place called Beaver. Canadians, especially New Brunswicker’s like their version the best. He also became Minister of Information, responsible for Allied propaganda in Allied and neutral countries. 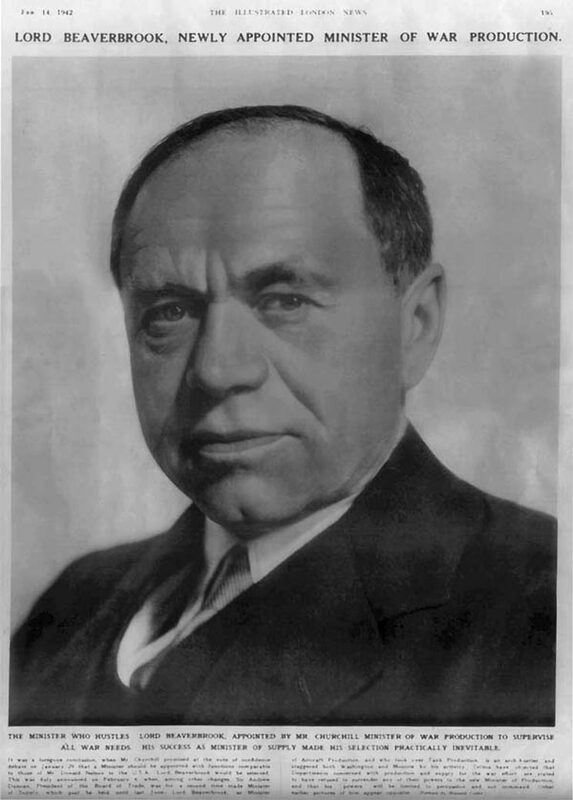 An energetic man, Lord Beaverbrook immediately set about a coordinated British propaganda program. His close colleague, Lord Northcliffe, meanwhile was responsible for directing propaganda towards the enemy nations. Formal dinner with Robert Stanfield, Winston Churchill, Hugh John Flemming and Lord Beaverbrook. Beaverbrook cleverly used contacts and ideas to commission a series of poster campaigns designed by famed artists of the period, and encouraged successful authors to write pamphlets and newspaper articles; the latter group included Rudyard Kipling, H.G. Wells and Sir Henry Newbolt, as well as John Buchan. Beaverbrook also pioneered the design and use of photographic posters for recruitment purposes at home and introduced cinema newsreels. 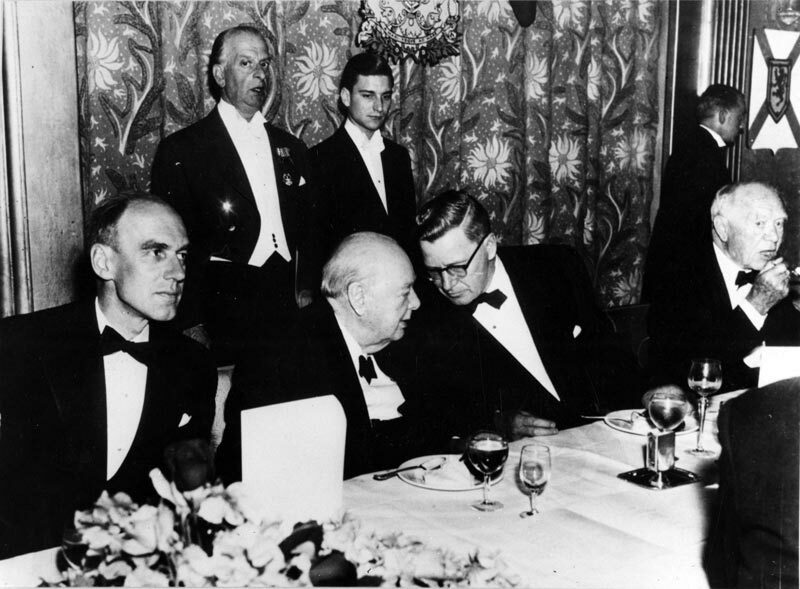 After a meeting with Winston Churchill, early in 1940, Beaverbrook threw his enormous energy behind the war effort. Churchill appointed Beaverbrook Minister of Aircraft Production, knowing how good Beaverbrook was at inspiring and driving staff. It was around this time that Beaverbrook introduced the idea/slogan of “Pots and Pans for Britain’s Planes“. This became a unifying call to all Britains’ and was a huge success. Through his energy and drive the British Spitfire planes were a force to be reckoned with and the eternal gratitude of Sir Winston Churchill. During WWII he served as Minister for Aircraft Production (1940-41), Minister of Supply (1941-42), Minister of War Production (1942) and Lord Privy Seal (1943-45).